In the Second World War, Italy was torn apart by German armies, civil war, and the Allied invasion. In a corner of Tuscany, one woman—born in England, married to an Italian—kept a record of daily life in a country at war. 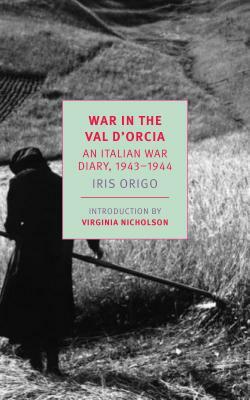 Iris Origo’s powerful diary, War in Val d’Orcia, is the spare and vivid account of what happened when a peaceful farming valley became a battleground. At great personal risk, the Origos gave food and shelter to partisans, deserters, and refugees. They took in evacuees, and as the front drew closer they faced the knowledge that the lives of thirty-two small children depended on them. Origo writes with sensitivity and generosity, and a story emerges of human acts of heroism and compassion, and the devastation that war can bring. 1939–1940; Leopardi: A Study in Solitude; and The Merchant of Prato, among others. Virginia Nicholson is a social historian and writer known for her works on women’s history. She is the the author of five books, including Among the Bohemians: Experiments in Living 1900–1939, and most recently, Perfect Wives in Ideal Homes: The Story of Women in the 1950s.